Here is what the Secret Livestock of Survival book by Rick Austin, is all about! When most people think of raising homestead livestock, they invariably think that they must have chickens and a cow. But truth be told, when it comes to raising livestock, there are a lot of reasons to avoid raising chickens altogether, and almost every reason not to own a cow. Just like in my previous two books in this series (the Secret Garden of Survival and the Secret Greenhouse of Survival), this new book, the Secret Livestock of Survival, will show you how to grow your own sources of food (in this case- protein), with a much better return on your investment of time, money, feed, housing and real estate, than with traditional homestead thinking. And these livestock animals are discrete, so most people won’t even know you are raising them. Now you can really live off the grid. Not just the electrical grid, but off the industrial food grid. And the less you are reliant on the industrial food chain, the wealthier and more secure you will be. This isn't only Rick Austin's best book yet, it is the best information on raising livestock for survival I have ever read. The easy to understand tips are great not only for beginners. The in-depth details about the various types of survival livestock Austin and his wife raise on their homestead, offers new insight for even seasoned preppers. 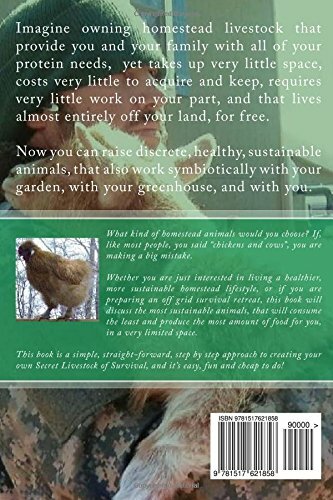 Perhaps best yet, you can embark on the survival farm plan outlined in the book without spending a ton of money or a lot of acreage - that is always a plus! Five Stars- Fantastic, informative book! Rick Austin has done it again with “Secret Livestock of Survival”! 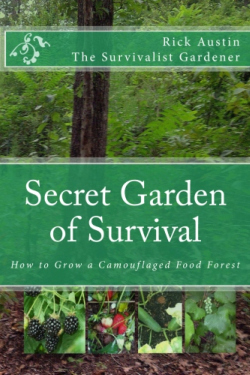 I got started with the “Secret Garden of Survival” after seeing Rick speak at a large homesteading event. His depth of knowledge and expertise immediately sold me and reading the book made me a true believer that I could actually have the ability to feed my family easily and affordably with my own food forest. I then purchased “Secret Greenhouse of Survival” and was amazed. Rick writes in such a way that even I can understand the step by step instructions to replicate his success in both growing food and utilizing the Greenhouse for myriad other purposes. Now, I’ve just read “Secret Livestock of Survival” and I can honestly say I’ve been inspired! I’ve been involved in homesteading for years now, but I haven’t had the confidence to venture into the arena of livestock because I just haven’t had the knowledge or experience that it requires. 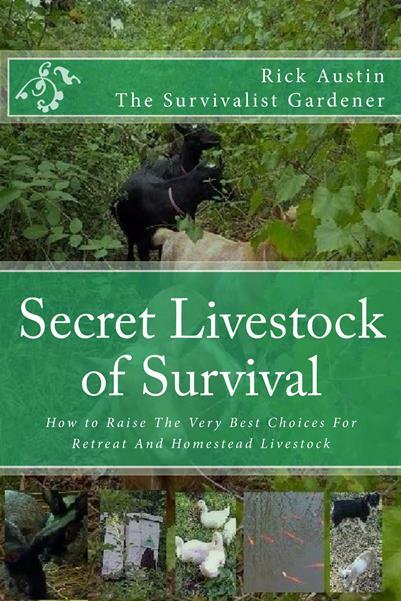 However, “Secret Livestock of Survival” is both comprehensive and easy to understand, so that even a beginner like me can succeed in providing protein for my family and be truly self-sufficient! Growing fruits and vegetables is awesome, but we have still had to rely on other sources for meat, milk, ice cream, cheese, etc. Our long term plan is to work the techniques described in all three of Rick Austin’s books so that our family can weather any crisis with confidence. I wholeheartedly recommend this book! The new book “Secret Livestock of Survival” is the meat and potatoes (or in this instance, meat, milk, and eggs) for information on creating and raising your own secret livestock for your survival on a homestead; in the most favorable and economical way. 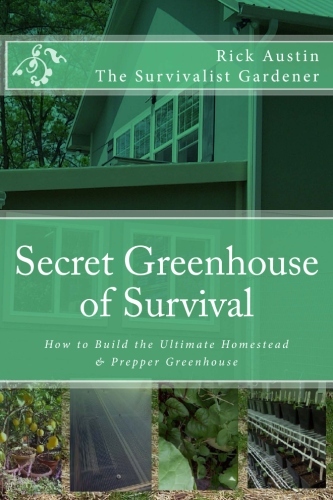 In this newest installment of the “Secret of Survival" series, the author not only explains to you what the best choices are in animals and fowl for a long-term sustainable homestead; and their ratio to feed vs output, he also shares inexpensive ways to maintain these animals in the least amount of space, shows you how to create the most effective yet inexpensive shelters to house them in, and the best “tried and true” equipment to use to water, feed and maintain them. The author further explains to you the reasons why some of the livestock animals most of us typically think about when considering a homestead may not be the best animals of choice for our long-term sustainable homestead, especially if the poo were to hit the fan and you have no way to feed these animals, and feed yourself and family too. In this book, the author truly lives up to his title of being a "cheap SOB” – but a well thought-out one at that! At the end of the book, Rick says that his purpose in writing it was to get the reader to look at things (homestead livestock, in particular) differently. Mission accomplished! I am an old guy, who grew up farming and ranching in the late 1950s and early 1960s in Florida. We were old school, working the land the way our fathers and grandfathers had. In retrospect, the hard way. No permaculture, no greenhouses, no "designer" livestock. Row crops, hay, cattle, hogs, chickens, cane and citrus. All worked by hand, or on horseback with a cur cow dog or two, or running an old two-banger tractor, from "can see" to "can't see." By careful research and countless hours of hands-on trial and error, Rick has figured out the right way to farm, and he explains his methods in a way that will save attentive homesteaders thousands of hours of their own trial and error. Farming and animal husbandry are not intuitive endeavors - - you have to actually know what you are doing. Rick's book, and its two predecessors, get you well beyond simply a starting point. I vouch for Rick because I know his goats, dogs, rabbits, ducks, chickens personally, and have been graciously fed the bounty of his homestead at the family table many times.